Governor Andrew Cuomo "insisted Monday (April 1) that New York will pass a law to legalize recreational pot before the Legislature adjourns in June," The New York Post reports. He's been promising legalization for some time. Many New Yorkers had hoped the measure would be included in this year's state budget. What's the hold-up? "You still need to control and regulate," says Cuomo. "You don't want 14-year-olds having access to marijuana, so how you do it is frankly the tougher part of the equation. In the rush of the budget, we couldn't do it intelligently." Those 14-year-olds already have access to marijuana. So does everyone else. Sure, the price of "illegal" marijuana might be slightly higher than the price of "legal" marijuana (to make the profits worth the risk of going to jail), but anyone who wants a bag of weed can get one in a New York minute. And they'll still be able to get it after legalization, no matter what byzantine regulatory schemes the politicians come up with and no matter how solemnly they aver that those schemes are "for the chilllllldren." Yes, that's really all there is to it. If you feel some irrational need to "protect the children" from a plant, set an age limit. Problem solved. Yes, they'll ignore it. Just like they ignore the age limits on alcohol and tobacco. They'll ignore it even if you only allow it to be sold in licensed facilities. They'll get fake IDs, or find helpful adults, or just buy it on the black market like they do now. They'll ignore it, and they'll ignore you. But hey, knock yourself out. Confused about how to tax marijuana? Fine -- DON'T tax it. Or at least don't tax it any differently than any other similar plant. Deem it a non-taxable food, or a taxable confection, or a taxable houseplant. There, you're done. There's nothing complicated about this. People have used marijuana for millennia. New Yorkers have used marijuana since there have been New Yorkers. They're using marijuana now and they'll be using marijuana a hundred years from now. The only correct answer to that question is no, they shouldn't. Legalize it, New York. All you other states, too. Let's get this silly war on a plant over with. The plant won. The plant has never not been winning. Surrender already. It's good policy, it's good politics, and it's just the right thing to do. 14 year olds also know how to grow marijuana. It is real easy to do if one has sun, soil, water, and seeds. The first draft of the column included something to the effect that "there's a reason it's called 'weed.' It grows in all 50 states. It grows outdoors. It grows indoors. It grows in ditches. If government can't eradicate thistle or ragweed, why does it think it can eradicate something people actually find USEFUL?" But that first draft came to more than 600 words, and I write to a maximum of 500. This one felt best at 450. Since marijuana was only made ILLEGAL back in the '40s, for benefit of pharms, logging and cotton, and probably pesticides, chlorine and ag biz, we ought be saying RE-Legalization. To just say "Legalization" suggests that it's a new thing....but it isn't. Before the '40s, cannabis was as legal as pie, corn or dandelions since forever. PS: Don't forget that publisher, Wm. Randolph Hearst largely pushed the ban on cannabis, not re/pot, except as a distraction trick, but to protect his timber/paper biz which would have been harmed by legal hemp-based paper....which, incidentally, needs no pesticides or chlorine bleaching. 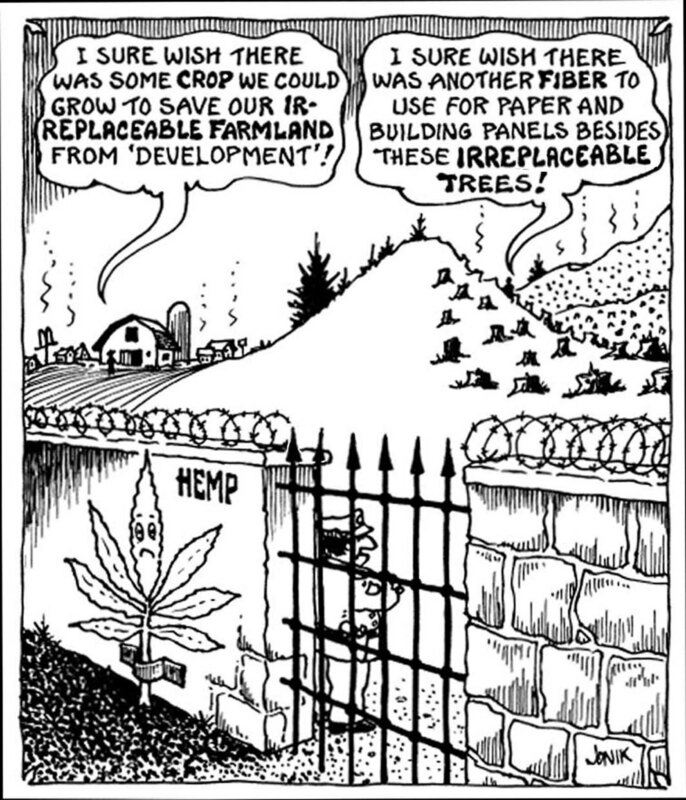 The pot angle was just a con-job way to prohibit hemp agriculture of any kind in the US. That would compete too well with Hearst's and other timber industries' environmentally-devastating practices. How many in prison, lives ruined/damaged, so that the Hearst ilk can continue clearcutting forests and destroying our environment? So Hearst newspapers made it a Racist thing...calling it "Marijuana" to raise the spectre of those darn Mexican criminals (sound familiar?) and calling it "reefer" to implicate those like black jazz musicians and fans and all. Lucky that now hemp agriculture is becoming legal.